How many Clarkies does it take to reduce the university’s carbon footprint? Recycling preserves natural resources and supplies valuable raw materials to industry. Recycling prevents emissions of many greenhouse gases and water pollutants, and saves energy. Recycling reduces our reliance on landfills and incinerators as primary methods of disposal, resulting in a longer life expectancy for our current landfills and reducing the need to open new landfills. Recycling saves money that would be spent on disposal costs by reducing the amount of trash we need to throw out every day. Recycling helps the economy, supporting more than 19,000 jobs in Massachusetts alone. 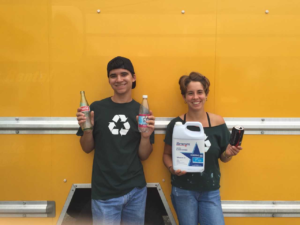 Recycling is more than putting things in the right bin. It is tied to the market. In order for recycling to have an impact on reducing the waste of scarce resources, recyclable materials must be included in manufacturing. Consumers – that’s you – have to purchase goods with recycled content. The Compost Guidelines will tell you what you can and cannot compost at Clark. The Department Guide to Compost Planning will help independent efforts in Clark’s Academic and Administrative offices get off the ground. The Alumni and Student Engagement Center has composting bins on every floor in the kitchens. 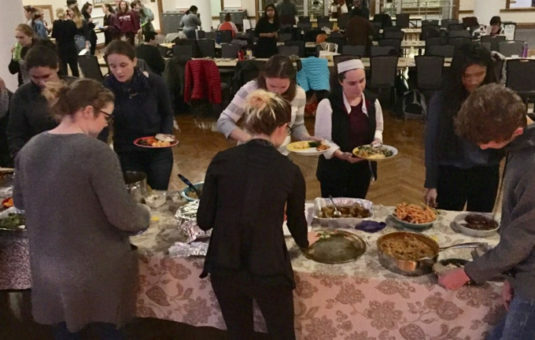 Clark began composting food waste in the Higgins Cafeteria in 2007 after nearly two years of research and proposals from a dedicated student team. A few years later, the Cafeteria began to compost soiled paper, and a few years after that, the Bistro switched to compostable containers and service ware. The Recycling Crew pulls out organics as they sort the recyclables from all over campus. In Fall 2013, the student team of Clark Composts! was successful in convincing Clark to allow composting in most residential halls, with infrastructure funding provided through the Student Sustainability Fund. In addition to the residential hall compost bins, the University Center has multiple locations to bring your collected organics: in the main hall, the Cafe, the Bistro, and the meeting rooms. In 2015 we began compost operations in the Academic Commons, in 2016 we expanded to the Bickman Fitness Center (paper towels are compost) and into the final residence hall, Blackstone. Many academic and administrative departments have self-managed composting, and all are welcome to do so. Clark continues to grow its capacity to divert organics from landfill or incineration through increased compost collection locations and individual effort. Diversion of organic materials—aka composting—makes environmental sense. Organic material such as food and paper waste decomposing in landfills releases greenhouse gasses and leachate, water that is toxic after percolating through the landfill. Incineration releases greenhouse gasses and harmful ash. Besides, its a waste of good, organic material that can be put to much better use. Composting provides an environmentally sound alternative that turns organic waste into humus that can be used to improve soil quality. Farmers have known this for thousands of years. “If it was ever alive, you can compost it”! Diversion of organic materials also makes sense economically for Clark. Our waste hauler charges less for picking up organics than for garbage because there are fewer regulatory risks (garbage can contain banned materials) and because the end product, compost, is a valuable commodity. Clark’s organic collection is processed at We Care Environmental in MA, becoming a high-quality, sterile, organic soil conditioner and additive. Primary uses for Clark’s compost include farms, bioremediation and organic fill applications. It’s easy to have a Zero Waste Event at Clark because we can recycle and compost so many different materials.